Hi there - I grew up close to the Bruce Trail in the Hamilton, Ontario area. Living close to the Niagara escarpment I was able to see a lot of different types of animals and birds. I've seen numerous foxes, tonnes of deer, coyotes, owls, peregrine falcons, bald eagles, but the weirdest one is the Possum. These adaptable little creatures are everywhere in the escarpment area, and some of them are not so little either. I did a paper on possums when I was in high school and there are a lot of misconceptions. 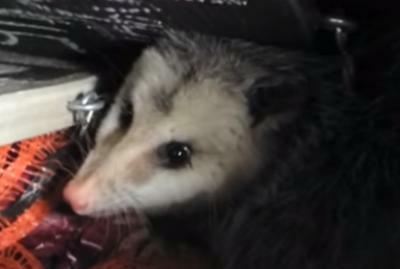 For one, if there is a possum in your yard or property there has to be a food source, they will eat anything from grubs to spiders, mice, snakes, basically anything that it can get a hold of. If you leave it alone once the food source is gone, it will go on its way. Another interesting fact is they are closely related to kangaroos and Koala bears. When they play dead or "possum" it is actually an involuntary action that is intended on protecting them. There are lots to learn about these animals, so next time you see one just let it do its thing. I admit they are ugly but basically harmless.